Simulaids proudly introduces the next generation forensic wound simulation training. This basic trauma evidence-gathering unit contains a series of wounds created specifically for teaching crime scene analysis and forensic scene reconstruction. The details in the wounds are designed to determine type of weapon, direction of force, and other related details that only come with realistic trauma reproduction. This innovative kit contains carefully sculpted models of injuries taken from actual victim’s wounds and reviewed by forensic education professionals, insuring real scene representations of trauma commonly found on violent crime victims. 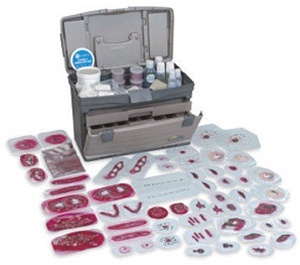 This kit is a must for any applied program of wound study. Materials in this kit will provide first time exposure to the novice as well as continued training for the professional already in the field. From simple puncture wounds associated with sharp instrument trauma to firearms entry and exit wounds, this kit is critical in studying the methodology of crime scene reconstruction based on wound demographics. Can you recognize pattern ligature in strangulation? What was the murder weapon? What does a single-bladed knife stab wound look like compared to a double-edged blade wound? What are the differences between the wound of mechanism for suicide and hesitation marks? Each of these and more are addressed with a kit that also includes moulage wax, coagulant blood, and a selection of makeup for bruising, blanching, and lividity. The entire kit comes placed in a sturdy carry cases for protection and ease of transportation to the training site. Proudly Manufactured in the USA by Simulaids.